Camden Market and Storefront have partnered up to offer brands the perfect opportunity to rent a short-term space in London’s largest and most diverse market. Offering exclusive spaces with heavy footfall from both locals and tourists, Camden Market and Storefront hope to provide the market with impactful experiences through short-term concepts. “London’s Camden Market is an iconic retail and leisure destination which continues to evolve. We are very excited to have partnered with Market Tech on Camden Market. Their flexible leasing approach to real estate perfectly aligns with the Storefront platform and sets an example of the future of retail and experience,” said Charlie Farr, Head of Business Development at Storefront. Today, the market provides over 1,000 places to shop, eat and pop-up, with global brands like Dr. Martens and Havaianas, as well as the now world famous The Cheese Bar, all attracting tons of shoppers and creating tons of buzz. Now with this partnership, thousands of other brands and artists can enjoy everything this destination market has to offer. Storefront has already signed Naked Dough into the market, popping up mid- Summer for a 1-year term. Storefront looks forward to matching more of Camden Market’s spaces with hundreds more quality independent brands like Naked Dough. “We are excited to open Camden because it’s perfect for our third store. Camden is a tourist hotspot with interesting retailers so we will hopefully fit right in. Storefront has a good relationship with the Camden landlords so the process of meeting them and confirming a site was very simple. We can’t wait to open for the Summer and become a tourist destination, too!” said Naked Dough co-founder Hannah Adams. “Since 1973, Camden Market has been working with innovative, unique businesses to develop unusual retail spaces; attracting a customer that is looking for something different to the norm. Fast forward to the present day, where we are looking forward to working with Storefront, using their services to highlight our one-of-a-kind retail opportunities to exciting brands, both big and small. We can’t wait to see the new talents and creativity that Storefront will bring with its services, as well as the new audiences that these businesses will bring with them,” added Stephanie Dye, Communications Coordinator at Camden Market. Storefront is the world’s largest marketplace for short-term retail spaces. The platform connects brands, e-commerce businesses and artists with space owners for temporary rentals. Storefront makes commercial real estate easily accessible for anyone looking to organize events and create pop-up stores around the world. 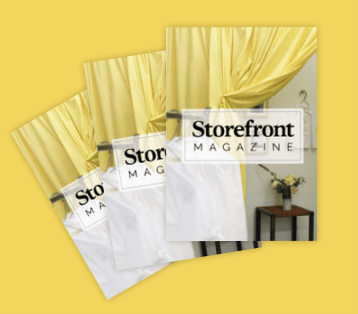 Since its launch in 2014, Storefront has supported more than 100,000 brands across the world’s largest cities, from Paris to New York to Milan, London and Hong Kong. The platform now has the largest network of commercial spaces available for short-term rental with more than 10,000 listings. Subscribe to our Newsletter and stay up-to-date on the latest trends in venues and get industry-specific tips on making your pop-up project a genuine success.